Hey guys! I have some exciting news about our next Chapter in our Next Steps in Guided Reading book series. We have a guest blogger right here hosting Part 2 of Chapter 6! I am proud to introduce you to Brooke! Now sit back, grab a pen and paper to take some notes and read on! Chapter 6 is broken into 3 parts! Welcome to another week of the #GuidedReadingGals book study. This is Brooke from First GradeWonderland and I am so excited to share what I have learned from reading Chapter 6. Thanks so much to Julie for allowing me to be a guest blogger on her page. My blog post will be focusing on the second part of chapter 6 (specifically pages 200-224), to read about other parts of Chapter 6, make sure to read the other #GuidedReadingGals blogposts from the link up at the bottom of this page. Chapter 6 focuses on fluent guided reading. I will be focusing on how we can implement strategies within guided reading to build vocabulary and comprehension instruction. -Students have multiple and varied encounters with the new words. -Students are taught strategies for learning new words. -Vocabulary is imbedded in text. Many of these elements can easily be implemented into any guided reading lesson to help directly teach our students a multitude of vocabulary words. 2. The majority of this chapter focuses on listing scaffolding steps for teaching a variety of comprehension strategies. Comprehension strategies are a large part of a fluent reader guided reading lesson plan. 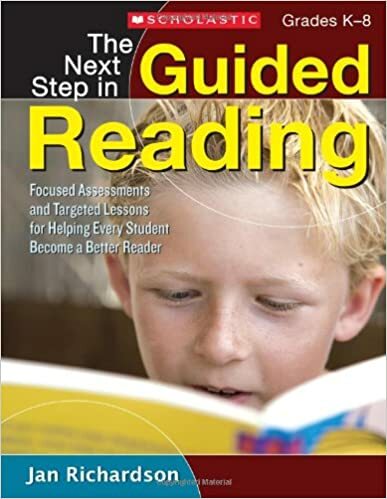 On pages 203-224, the following comprehension strategies are detailed: making predictions, making connections, ask questions, determine importance, visualize, and summarize. 3. I love the way that Dr. Richardson details summarizing and how to do it starting on page 220. Summarizing is something that I believe is hard for students to do, as they may have trouble specifically pulling out just the important parts. I remember having issues myself with summarizing as a student, I would want to basically re-write the entire book, afraid of leaving anything important out. The key word/summary scaffold taught on these pages is a great tool to implement with fluent readers. 1. Using something as easy as small sticky notes to help plan your vocabulary instruction can help your guided reading lesson go smoother and to make sure you are including the vocabulary instruction that is so important for fluent readers. On page 201, Dr. Richardson details the plan that she uses when planning vocabulary instruction for her fluent readers. 2. On page 214, Dr. Richardson details question cards that are adapted from the QAR strategy. Incorporating different levels of questioning (green, yellow, and red) in a fluent reader guided reading lesson is a great way to boost comprehension. Check out the rest of the #GuidedReadingGals posts by clicking on their links below!